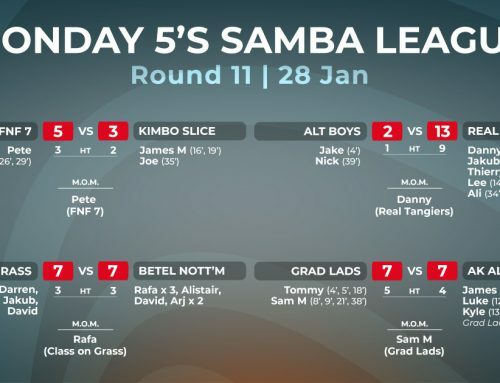 ALT Boys faced a Grad Lads team that despite losing to Betel last week, are still in the mix for the league if results land in their favour. It took four minutes for the first goal to be scored, when Gus hit the target for the Lads. More goals followed for them, and by half time they had scored five without reply. ALT Boys had a mountain to climb in the second half, if they hoped to salvage the game. 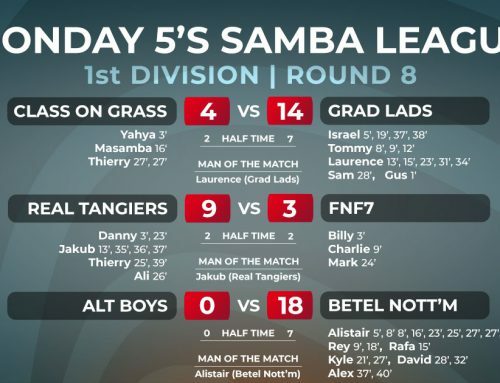 Unfortunately for them the Lads were in a scoring mood and by the time the ref blew for full time, they had doubled the first half goal haul and wrapped-up the game ten-nil winners. Dan W and Laurence each enjoyed hat-tricks, and with all out-field players getting on the score sheet, they really separated the Lads from the Boys. When these two met earlier in the season it was Class on Grass that claimed all three points in a nine-three victory. With their opposition tonight having not played since mid-December, would AK be rusty, or firing on all cylinders? Two minutes into the game Class on Grass’ top scorer, David, fired home, taking his season’s tally to 17. AK fired back though, man of the match Luke Wheeler opening his account. 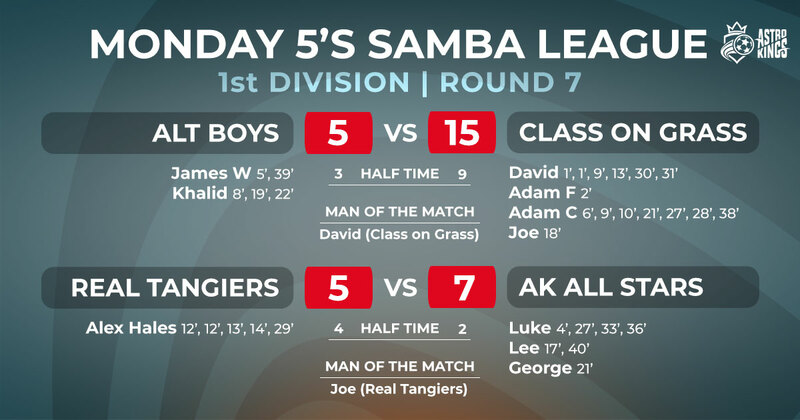 After a dramatic half the scoreline stood at four-two in AK’s favour. What was a fairly close first half turned into a one-sided second. 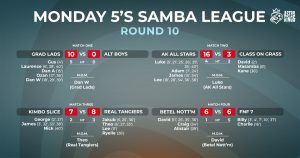 AK went into rapid fire and scored a dozen past a tiring five-player Class on Grass side, with Lee and Luke finishing up with five and seven respectively. AK now trail league leaders FNF 7 by six points. 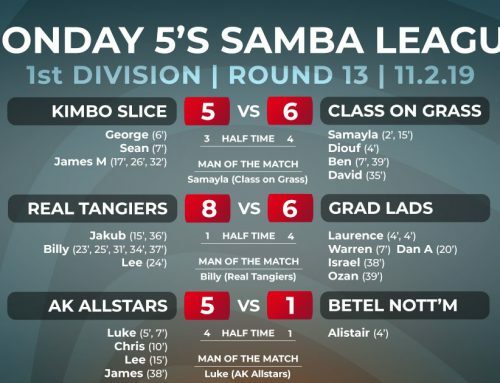 Second placed Real Tangiers faced Kimbo Slice, a team that haven’t lost since late November. 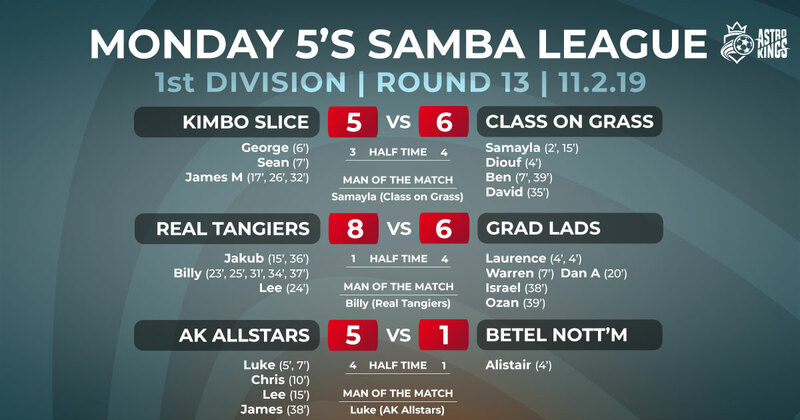 It looked like Kimbo were to continue their form, as George and James put them two-nil up inside three minutes. Real struck back with goals from Jakub, Theo and Lee, and ended the first half three-two up. The second half saw plenty of action, and not much separated the two. 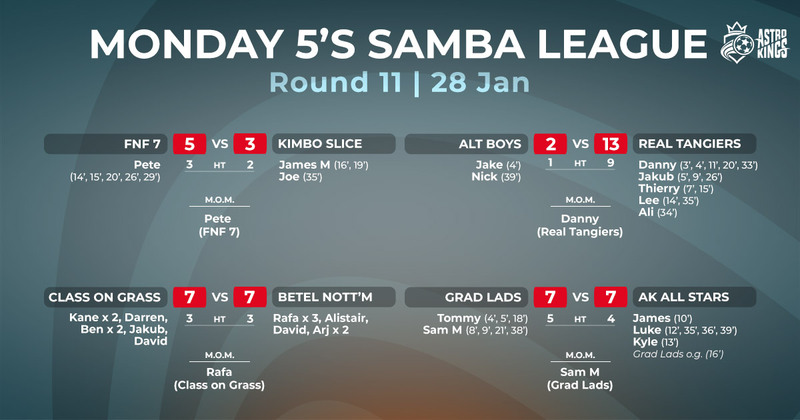 James Mortimer was on target for Kimbo to take his night’s tally to four, but hat-tricks from Jakub and man of the match Theo, made the difference on the night. Real are sitting in second place in the league, but with a goal difference of minus one, they’ll need to win by some big margins to bring their goal difference in line with the teams around them. 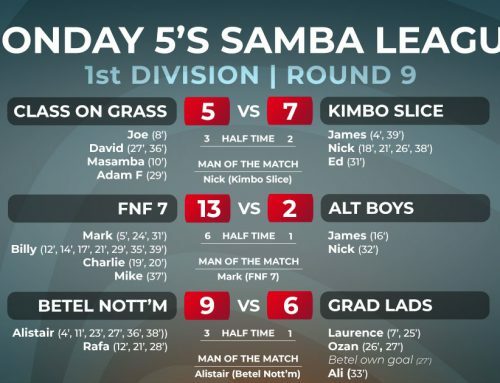 Last season Betel Nottingham pipped FNF 7 to the title just on goal difference, so tonight’s fixture carried a lot of history, especially as FNF beat Betel 10:6 earlier in the season. 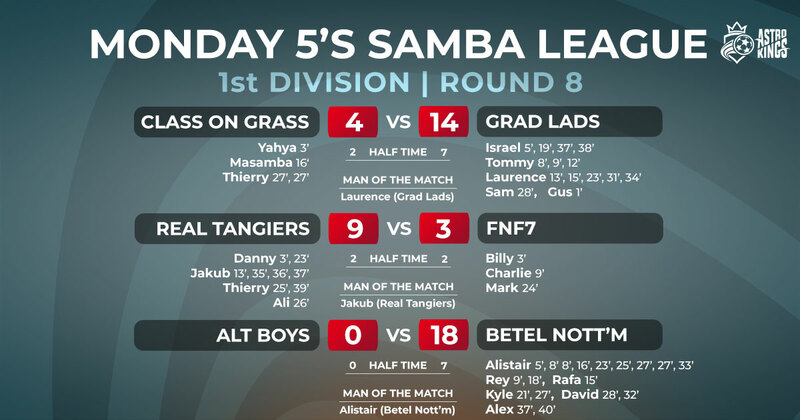 Current league leaders FNF had a dream start, when goal talisman Billy netted four in the first ten minutes. When the half ended five-one to FNF, they were certain the three points were in the bag. Whatever Betel discussed at halftime, perhaps tactics, inspiring words or a war cry, it obviously worked. What was a big deficit heading into the second half, turned into an epic comeback. 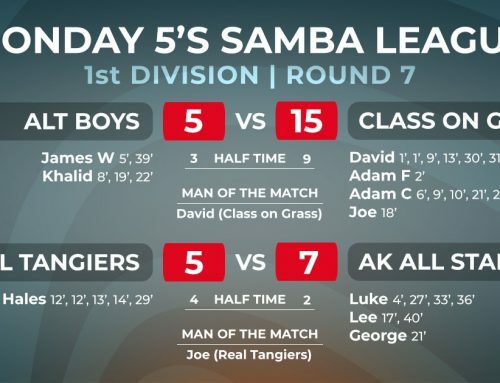 FNF took their foot off the gas, and when man of the match David scored his fourth goal, it levelled the scores at five-all. 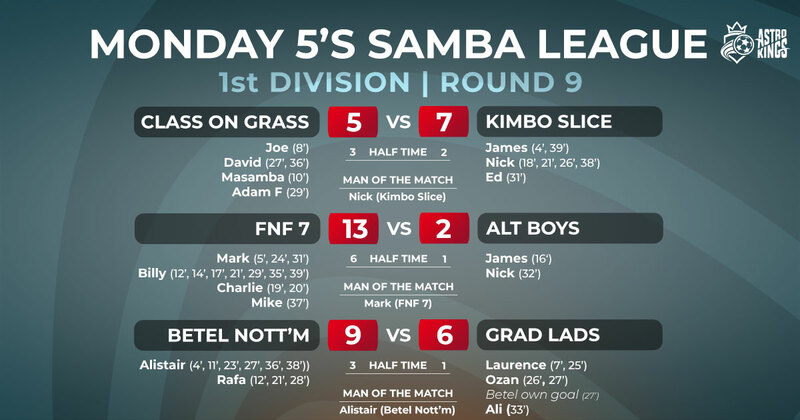 Billy wanted the victory though and scored his fifth with 3 minutes to go, putting FNF ahead. With a minute left on the clock, Betel kept pushing for an equaliser, and their prayers were answered when Alistair slotted home, his 19th of the season. A great game, and now only six points separate the top five teams. At this stage, the league could be anyone’s.